Eleven-year-old Cassie Anderson, Peacock Detective, like all great detectives, is good at noticing things. She notices the scratches in the corner of the cage when the peacocks William Shakespeare and Virginia go missing from Mr and Mrs Hudson’s backyard, and the half-smiling, faraway look that her dad gets when he’s watching her mum. But although Cassie notices a lot of things, there’s a lot that doesn’t make sense. Like why her sister, Diana, who is 14-going-on-15, is living in the backyard and doesn’t go to church anymore. And why her best friend, Jonas, doesn’t call his parents ‘mum’ and ‘dad’ like everyone else. And why Rhea Grimm is so mean. And why her dad has started going to The Clinic when he should be going to work. 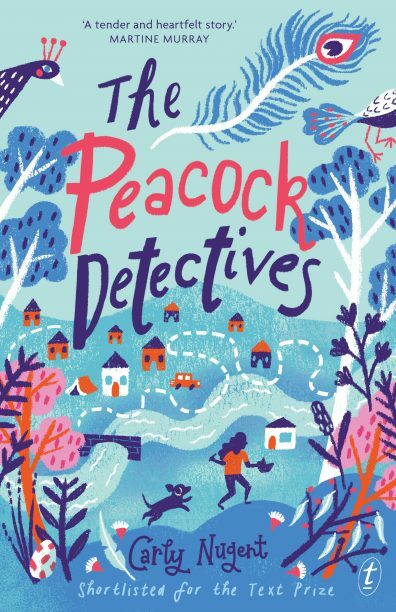 Through the eyes of this beautifully awkward and naïve narrator, The Peacock Detectives delivers a story for middle-grade readers that is heartfelt and funny, with a powerful message about people—old and young—learning to understand each other better, and learning to understand themselves better in the process. Reminiscent of Harriet the Spy and A is for Alphabet, Carly Nugent’s debut, is a lively and generous story that acknowledges the powerful feelings of its readers, and the space they occupy in the world.